I've backpacked, camped and fished all over the lower 48 states with my family as a kid, and then life happened. I've restarted these activities about four years ago - I dayhike or backpack 2-6 times a month. I am between light and ultralight. 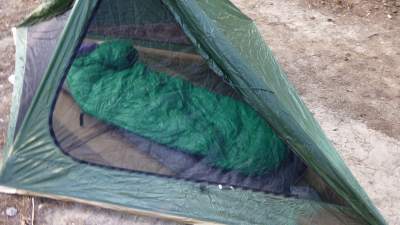 I have a hammock system and own a Tarptent. My base weight depends upon season and where I go. Measured Size: 20 x 72 x 3.5 in (51 x 183 x 9 cm) - approximately, as full as I could inflate it. The Big Agnes Insulated Q-Core (hereafter "the Q-Core" or "the pad") is a non self-inflating pad for three season backpacking. The Q-Core is silver on top and black on the bottom. It is rectangular with an inflation valve in one corner. The Q-Core came with a mesh stuff sack and a repair kit consisting of a tiny tube of sealant and some nylon patches. The Q-Core is described as having X-Static insulation. X-Static is a performance textile fiber with a layer of silver permanently bonded to the surface of the fiber. This gives the fabric anti-microbial, highly reflective and conductive properties. It also reportedly prevents odors. The listed estimated R-Value is 5; the pad is listed as being warm to 15 F (-9 C). The pad is constructed with an alternating "I-Beam" construction, meaning that it has neither horizontal nor vertical air chambers, but a cross-hatch pattern that results in a flattish surface. The outer lengthwise sections of the pad rise slightly higher than the rest of the pad, like side bumpers. The Q-Core hang tag specifies that the pad should be stored unrolled with the valve open. 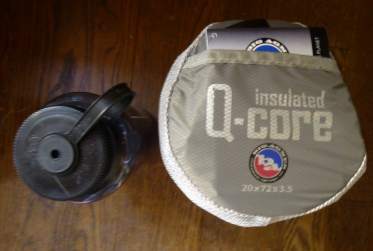 The Q-Core arrived neatly stuffed into its stuff sack, with the hang tag tucked in the pocket on one end. I unrolled and blew up the Q-Core, then tried it out on the hardwood floor in the dining room. I promptly fell asleep until the cat woke me up. I tried it at varying inflation levels, and find that it is most comfortable for me when I inflate it fully, then let out some air for a few seconds before closing the valve completely. The lengthwise side baffles inflate a little higher than the flatter area down the middle of the pad. Perhaps to help keep me from rolling off the pad? Lying on the pad, I can feel the warmth of my body reflected back to me. I like the cushion of the pad. The nylon shell seems durable enough and the regular size feels luxuriously long for me, since I am a side sleeper and curling up on my side gives me plenty of room. The texture of the pad against my skin is soft which is good, since as a quilt user I will have it in direct contact with my skin sometimes. Deflating the pad and getting it back into the stuff sack was a little more work than blowing it up. I rolled the air out, folded the Q-Core in thirds, rolled, and couldn't get the pad all the way back into the stuff sack. About an inch of it stuck out the top. I tried again, squeezing out more air, and barely got it in. I am not certain how I could keep squeezing out air twice over - it appeared quite flat! I have the feeling there is a knack to storing the Q-Core - perhaps practice will make perfect. I used the Q-Core while on a two night outing with my hiking group in Yosemite National Park. The night temperatures ranged from 45 - 50 F (7 - 10 C). The weather was fair. We base camped at about 7,000 feet (2,133 meters) in elevation. I spent the night at Pear Lake after summiting Alta Peak in Sequoia National Park. It was windy but not cold, around 55 F (13 C), all night. We were at 9,550 feet (2911 meters) elevation. I spent nine nights on the Q-Core while backpacking from Florence Lake to Courtright Lake, traveling a winding route up to Evolution Valley, Goddard Canyon, over into Red Mountain Basin, Bench Valley, and down the north fork of the Kings River. We hiked about 50 miles (80 km) and part of our trip was cross country. Our elevation ranged from about 7,500 feet (2,286 meters) to 11,000 feet (3,362 meters); most nights we camped below 10,500 feet (3,200 meters) and night temperatures ranged from 40 - 45 F (4 - 7 C). I also used the Q-Core at the coast, in a campground at Montana de Oro State Park. We stayed two nights within half a mile of the ocean. Night temperatures were about 50 F (10 C) and the weather was overcast and drizzling or misting, with some clearing on the second day. We were just above sea level. I spent the Labor Day weekend (September 1 - 3) backpacking from Mineral King over Farewell Gap into the Golden Trout Wilderness, where we experienced a low of 35 F (2 C) at night. I slept comfortably through each of the two nights we spent along the Little Kern River. It's been a relatively warm summer! I have not experienced night temperatures that dropped below freezing, so am not able to rate the warmth of the Q-Core to its advertised limit yet. It was definitely adequate for the temperatures I've experienced so far. I can feel the warmth reflected back to me while lying on the pad. Blowing up the pad takes some effort, but has not been a problem for me. It has caused some comments from others. It does take more breaths to fill the pad than my previous one, which was shorter. However, the end result is worth the trouble. I toss and turn all night, apparently, and walk the pad back and forth in my sleep; I have awakened a few times with my head against the side of the tent or with my feet dangling off the end. When I roll over or shift position, I quickly find a comfortable position and doze off again. I haven't had a problem staying on the pad. Perhaps those vertical side baffles are doing a good job! 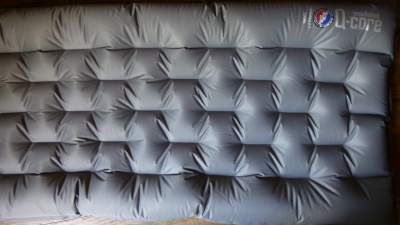 The cushion and comfort the Q-Core provides has been consistent. I have even slept in short sleeves directly on the Q-Core and been comfortable. The nylon is smooth but not slippery. I have improved with practice the process of deflating and rolling up the pad, so getting it back in the stuff sack has been less of an issue. It helps to roll the pad up slowly with the valve open, close the valve when the majority of the air is out, and unroll it again. Then I fold it in thirds and roll tightly as I can, pressing on it as I roll, until I need to open the valve and let out more air. Once the pad is rolled up I close the valve again then stuff it. Unless I am lazy and roll it too quickly, with the end result being a little too long to fit in the sack. I'll pack it that way anyway, and so far it's not been an issue. The Q-Core spent nine days with my bear canister riding around on top of it without issues. I've had to use a damp towel to wipe down the Q-Core twice so far. On my coastal campsite we encountered very fine silty dirt that seems to cling to nylon no matter what - shaking it from my tent or the Q-Core proved impossible. After my overnight at Pear Lake, when the wind blew very fine bits of decomposed granite through the mesh, I could feel the gritty particles on the floor of the tent and on the Q-Core, and had to wash both with a damp microfiber towel to get rid of it. In Mineral King, the night before our backpacking trip into Golden Trout Wilderness, we spent the night in Cold Springs Campground. I arrived late and since it was a clear night I blew up the Q-Core, pulled out my quilt, and slept on the ground without the tent or a ground sheet. With the pad directly on a patch of dirt and rock, I had no issues with punctures, despite my finding out the following morning that I'd placed it on numerous embedded rocks sticking out of the hard packed dirt. The pad seems durable and while I won't make a habit of doing it, it's nice to know that missing a rock here and there when choosing a site won't kill my pad. So far, I am enjoying a good night's sleep each time I blow up the Q-Core. I have nothing to complain about, though I really do wish it were lighter than it is. It might have made it less durable to make it from a lighter (probably thinner) material, I suppose. I'm looking forward to spending some more time backpacking with it as nights grow colder. I used the Q-Core on a solo overnight into the Kaiser Wilderness, where I woke to frost. Weather was clear, and the overnight low temperature was about 28 F (-2 C). I took the pad with me on an overnight Search and Rescue training, where our base camp was in a parking lot near Shaver Lake, in Sierra National Forest. The weather was variable, cloudy to clear, and night time low temperature was 40 - 45 F (4 - 7 C). 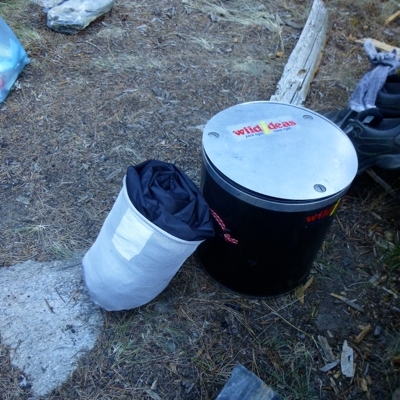 I carried the Q-Core with me on a one night backpacking trip to Moose Lake, in Sequoia National Park. The low temperature was about 30 F (-1 C) and we received about an hour of rainfall before dinner, after which the clouds drifted off to the south and left us with clear skies. I took the pad to Pine Valley in the Ventana Wilderness, Los Padres National Forest. Overnight low was about 32 F (0 C) and clear skies. We had frost in the meadow the following morning. I've continued to enjoy using the Q-Core as the temperatures drop and winter approaches. It's a stable and comfortable sleeping pad. I over-inflated it one time, then spent a groggy hour wondering why it wasn't so comfortable (worked hard that day, and exhaustion makes me dumber than usual) before letting out some air to restore the expected level of comfort. I have noticed no real wear despite all the use. There is a small stain on the silver side of the pad that won't wash off with water and a rag. It's probably pollen or decomposed cedar transferred from my pants, after I sat on a log in one of the campsites. I don't mind it; the pad doesn't have to look good, just keep me warm and give me sound sleep at night. I think that I will be using the Q-Core for some time to come, because even though it has added a few ounces to the pack weight, it continues to be comfortable and warm even as the temperatures have dipped below freezing. This concludes my test series on the Big Agnes Insulated Q-Core. 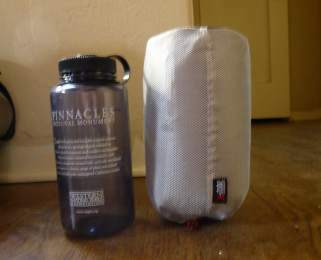 Thanks to Big Agnes, Inc. and BackpackGearTest.org for the opportunity to review this blissfully warm, comfortable sleeping pad.